This entry was posted in Sin categoría by juanmanuel. Bookmark the permalink. Thank you for all your hard work. It is greatly appreciated. I’m glad. You’re welcome man!! I have been living with this bug for a year and a half and so glad to finally get rid of it! thank you for the effort you took eliminating that frustrating problem which lasted so long. Im now very happy with my machine (NP900x3f). Good job and we need those people in our community having your attitude. Thank you and many greetings from Germany! Agreed, definitely. Unfortunately, we also have some people (just a few) with the attitude of trolling and obstacoling, as Juan unfortunately noticed while helping us. I’m glad. I appreciate your comment very much! Thank you so much, I’ve been looking for a fix for over then 6 months. Thanks a lot for your hard work, this had been annoying me for the past year and a half and I’m glad to see this finally sorted. That is a long time! I’m happy we can all now fully enjoy our laptops. You are THE MAN. I too have been working around this issue in bizarre ways (I thought having the laptop plugged in when resuming was causing it, but I would still charge it once suspended, so I would inadvertently trigger the problem after doing that a few times). This was becoming a serious issue, because if I accidentally plugged it in before resuming, it would be stuck thinking it was plugged in, and not warn me at all if I unplugged it and the battery died down. And this is saying nothing of the considerable power-saving measures being ignored because the system things it’s running off AC. I wish I could have sent you the smile on my face when I compiled your fix, ran it, unplugged the laptop, and saw the backlight auto-dim!!! You should set up a simple way to accept donations. I would gladly toss $5-$10 your way for the functionality it’s returned to me. Such Good Feedback. Wow!! Made my day! If it makes you feel better, I just put up a donation button at the bottom of the post and the blog’s sidebar. But really, your nice ‘thanks’ is more than enough for me. That kernel patch was made by Kieran Clancy and tested by me and others. close lid suspend seems to work fine now. btw, is there a way/tutorial on how to boot thru the flash drive? > close lid suspend seems to work fine now. > btw, is there a way/tutorial on how to boot thru the flash drive? About booting to the SSD, the bios doesn’t see it as a bootable drive. I have a 24GB SSD alongside a 500GB HDD. I have linux installed to the SSD, and the /home and windows partitions in the HDD. What I did was use a free program called EasyBCD to add linux in the SSD to the windows boot menu. Note: ‘sda’ is the HDD and ‘sdb’ is the SSD in my laptop. (from a live usb, after installing linux to the SSD). Restart after that, and you will be booting directly to the SSD from now on. EmbeddedController GPE events flushed. New events can be produced now. Also, remember it takes about ten seconds for the lid event to be produced. I’m not disciplined enuf to register exactly the events leading to that intermittent behaviour. it did suspend. and again. but it does fail every now and then. So the program is not running automatically in your system. Events will get accumulated in the embedded controller during sleep (such as battery % change, or AC plug/unplug), until you run the program manually. (and maybe a different script; you can base it in existing scripts in that directory). If in doubt, please re read carefully all the info. And don’t hesitate to re-ask, it is no problem. Wed Mar 5 16:36:32 BRT 2014: Finished. Wed Mar 5 17:08:54 BRT 2014: Finished. The problem was not the ownership of the file, but the location. If it was the correct location in the first place, it wouldn’t have let you create the file without root. You don’t need to post the entire pm-suspend.log. See if you have an existing directory in /usr/lib64/pm-utils/sleep.d and put it there if so. Sorry, I re-read your post, and since it has /usr/lib/pm-utils in the suspend log, now I think you did it in the correct directory. So that means that the location of 99samsung_fix_ec_events is not the issue. Have you put the compiled file in /usr/local/bin/samsung_fix_ec_event ? Or edited 99samsung_fix_ec_events to point it to the location of the compiled file? fingers crossed, it’ s been a few days and many suspend / resume on close lid without a flaw! apparently the very last reboot has fixed it all, thanks and thanks again and again. for booting thru the SSD. I don’t have ruindows from inception. now my ssd isn’t mounted at start up; I have to click on nautilus to bring it to life. except that boot is thru hdd. > suspend / resume on close lid without a flaw! > for booting thru the SSD. My instructions were for once having linux installed directly to the SSD, then booting directly to the SSD partition. I personally do that. I have the “/” partition in the SSD and the “/home” partition in the HDD hard drive. Maybe I didn’t understand what you meant by “booting thru the SSD” ? the ssd in my samsung is not mounted automatically upon boot. the boot is a lot slower than before getting rid of ruinows because, I presume, it is done thru the hdd. I see, I think that what you mean is use the SSD as a cache to speed up booting as Samsung does using ExpressCache in windows. This is not yet well supported in linux. I could point you to dm-cache but it was experimental. I don’t know of a way to use the SSD as boot speed up cache in linux. What I did was install linux directly to the SSD, and then boot straight there (no caching). For that, you would need to reinstall linux. (And follow my instructions after install). It should hit linux distros in late 2014 or beginning of 2015. Finally someone found and fixed it. THANK YOU! This was such a frustrating issue. Thank you!, the paypal arrived well. Very much appreciated!! I’ll try your linux new bios version check tonight on my NP530U3C, it is a great step towards not depending on windows. It works on my gf 900x3c. The only thing that doesn’t work correct yet is the notification of the battery status in Linux Mint 16 cinnamon when you hover your mouse over the battery icon. It states either laptop battery or AC adapter, depending on the state the system booted with. It doesn’t change when the adapter is plugged in or out. The charging symbol does change correctly though..
Maybe you didn’t set it up correctly to autorun on resume with the second file, the method might be different for a different distro (99samsung_fix_ec_events works for ubuntu/debian and others). Also, if while suspended the laptop runs out of battery, the program wouldn’t run on resume. In that case, you can run it manually, or set it to run on start editing “rc.local”. You can close acpi_listen with CTRL-C. If you don’t see the events when plugging/unplugging, you need to run the ‘samsung_fix_ec_events’ program again. If you do see the events but Linux Mint doesn’t change the status in the battery icon, then it is a problem with linux mint. All is working well, hibernate works, suspend works and if I plug in the AC the symbool for charging is shown in the taskbar. It is just the strange thing I noted above. ac switches from 0 to 1, but battery says in both cases 1. The acpi_listen output that you posted is the expected output, and it means that you don’t have a stuck embedded controller at the moment, otherwise, you wouldn’t see anything in acpi_listen. So I guess you should report a bug to Linux Mint maybe, for that last remaining thing. Batterylife is not good. Much shorter than in Windows. I installed Jupiter, but I’m not sure it helps much. I get comparable battery life, though just slightly less in linux. “upower -d” or “upower –monitor-detail” will tell you how many watts of power the system is consuming (when on battery). It can estimate this because the rate at which the battery is discharged is the power being consumed (roughly). It also tells you how much time estimated you have left on battery, at this level of power consumption. You can compare this to what windows tells you. Mind you, that if the screen had been off or on low brightness, the estimated time will be much higher. You can see how different things like changing screen brightness or wifi affect power consumption and time left on battery. “powertop” is very useful to diagnose programs, processes and hardware/drivers which are not letting the CPU go into low power states, and interrupt it constantly. Use the “TAB” key to go into each of its screens. “turbostat” tells you the power in watts consumed by the CPU package (as opposed to the whole laptop), and the average clock speed of each core and its temperature. You should see about 0.8GHz of speed when idle. If you don’t see that, or close to that, it means either that your laptop is not in “ondemand” or “powersave” mode, or that there is some program active all the time, forcing the CPU to max clock, and thus consuming more power. Also, if your laptop is always in “performance” mode, even when on battery, it might consume power quickly. Review your distro power configuration. Does it mean when updating to this kernel I can delete the 2 files? > Does it mean when updating to this kernel I can delete the 2 files? Just updated to 3.13.7 and deleted the 2 files and it works all fine! The bug in Mint 16 Cinnamon is still there. I’m going to see if it also exists in Mint 16 Xfce which I have somewhere. I’ll file a bug report to them. Any ideas on battery savings? Le bug est résolu et tout travail bien. J’ai résolu le problème en installant le nouveau kernel 3.13.7 (Debian 7.4). Merci d’avoir inclut le correctif dans le kernel car j’ai peu de connaissance pour patcher. > Le bug est résolu et tout travail bien. I’m happy for you! That’s great! Battery state detection and suspend-on-lid-close works fine now since upgrading to Ubuntu 14.04. Thank you so much Sven!!! It arrived fine. I’m running a stock Ubuntu 14.04 with the latest patches installed and the ATIV Book 9 NP900X3G (successor model of the NP900X3C) is not going into standby when I close the lid. So it looks like it is also affected. NP900X3C in contrast is suspending perfectly with the exact same Ubuntu version and patches (I have them sitting side by side). Since that model is the new haswell generation It might be a different problem. Also, you could try running the little program in my post above. If it doesn’t work, then it might be a different problem or a problem with Ubuntu itself or its configuration. Now that I’ve tested a bit more, it seems automatically suspending works just fine (I’ll have to watch it a bit more though since I executed your test application once). What is instead happening is that the laptop automatically resumes from suspend when you open the lid. This made me think it didn’t suspend at all. My fix is a small .c program that empties the EC queue so that it isn’t “stuck” anymore (in my case it affected LID close detection and charging detection, on my ultrabook model). My fix is included in this post above, and it is not that hard to run it. The fix was converted into a kernel patch and included in kernel 3.13, but we recently became aware that since kernel 3.16, some modification to the kernel is making the kernel patch not work. If you have a kernel version 3.16 or newer, you can run my program manually, included here in my blog post. I see that you indicated that you have kernel 3.17. Otherwise, I recomend to downgrade to an older kernel. For instance, I’m still on Kubuntu 14.04.1 which has kernel 3.13. It is an LTS (long term support) version. I will not upgrade to Kubuntu 14.10 until they fix the problems introduced in the new kernels with samsung laptops. Hello, yes, I was commenting on “If you have a kernel version 3.16 or newer, you can run my program manually, included here in my blog post” which seemed to indicate that in a 3.16+ scenario the program works where the kernel patch doesn’t. It wasn’t the case for me. For now I’ve associated the power button to the suspend action, will keep an eye on bugzilla. Your comment is an interesting data point on the current problem then, you might want to make a comment on the bugzilla thread. I’m too busy with work these days, otherwise I would get involved in at least testing the newer kernels, and helping out with the new problem. For now, I’m just keeping an eye on the discussion. i have the same problems with my ATIV Book 8. LID close is not recognized and plugging ac adaptor also. I use Kubuntu 14.04 and have installed the mainline kernel 3.13.7 because there is the samsung fix included. no change at all ? Any Idea ? Amazing i have tested aptosid livecd with a 3.9 kernel . When i boot from a live usbstick all acpi events are recognized acpi_listen shows every LID close and open are shown imediatly. What does it mean for me ? A big thanks. I saw used the utility, then saw Keiran’s patch and rejoiced. Sleep and resume are reliable, and have been for awhile. Yay! I’m now seeing a new issue (Boo. ): Occasionally the laptop will resume from sleep with the lid closed. Luckily these ultrabooks don’t fry themselves with limited airflow. When you want to resume the laptop, do you press the power button or is it setup to resume on lid open? Those options I think are accessible only through the windows samsung utility. Try disabling any “smart” options on the windows samsung programs, they interact with the bios directly. I don’t use inter rapid start and haven’t had the issue (in fact, my 24GB SSD holds the linux root partition, with /home mounted on the big HDD, so I don’t use intel rapid start which requires a dedicated partition in an SSD). 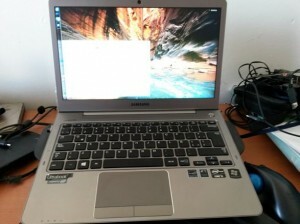 I faced the same problem of a non waking up Samsung NP900X4C laptop running Linux Mint 17 (well known for having an Ubuntu base). After implementing the good documented code and script and is now working as expected of resuming after opening the lid again. So much more fun now with my Linux Samsung box. The kernel fix has served me well for years, but they have broken it again! For some reason, the code added by the patch to ec.c that fixed the problem was taken out at 4.11 (acpi_ec_clear) was taken out. I am trying to find out why, but without much success. Your little samsung_fix_ec_events is working for me again! Oh that’s sad! I hope you find the reason why they removed it. I’m still on kernel version 4.10 in that laptop. At least we’ll always have the samsung_fix_ec_events workaround, although it’s not as optimal for non power users as a fix right inside the kernel. Thanks for investigating the issue and for publishing your findings and fixes. Installing CentOS 7 in 2018 on an old NP900X3C: your fix is still needed. Someone removed the kernel version of the fix from the kernel not too long ago. I’m not sure what was the reason. If you want you can leave a comment there so that the kernel guys finally push the fix upstream again. As for me, I’m still using the laptop (but my primary machine is my desktop PC), it currently has my userspace fix applied, and it’s running Kubuntu 17.10. …so my technical 900 is up to kernel 4.15 and I noticed that Kieran’s fix had stopped working a few updates ago, so I’m very happy that your fix is still relevant. Thanks again. I’m glad it still helps!!! I still don’t know why they removed it. But they were trying to bring the fix back, it seems it’s ready (maybe needing more testers, maybe you are willing to compile your own kernel). 1) Uses a real 2.5″ HDD that is easily replaceable (just removing one screw!) with a 2.5″ SSD. Newer machines have M.2 drives and no room for 2.5″ drives, and those M.2 drives are a pain to upgrade and clone to a bigger drive. 2) Has upgradable RAM! Mine has now 12GB. Newer machines tend to have all the RAM soldered to the motherboard, or not easily replaceable. The RAM slot in my Samsung Series 5 is behind the same door with a single screw. I already replaced its battery with a brand new one (but that was a pain, the bottom cover is held by plastic latches in addition to all the screws, I always fear I’m going to break the latches). And I think its time for me to replace the thermal paste of the CPU. I have some Arctic MX-4 leftover that I’ll probably use. I’ll probably do it this summer (summer begins december 21 here). Thermal paste dries up at around 4 years, and I can already tell watching the CPU temperatures. The Arctic MX-4 is supposed to last 8 years, so far I haven’t used it that long yet in my machines. Thanks for your comment Karl! hOur company provides a wide variety of non prescription drugs. Visit our health website in case you want to to improve your health with a help health products. Our company provides a wide variety of non prescription drugs. Take a look at our health website in case you want to strengthen your health with a help health products. Our company provides a wide variety of non prescription drugs. Look at our health website in case you want to strengthen your health with a help of generic supplements. Our company offers herb-based health and related products. Visit our health contributing site in case you want to feel healthier. Our company offers supreme quality health products. Take a look at our health contributing site in case you want to improve your health. Our company provides a wide variety of non prescription products. Take a look at our health portal in case you want to look healthier with a help health products. Our company offers a wide variety of non prescription drugs. Visit our health site in case you want to look better with a help general health products. Our company provides a wide variety of non prescription products. Look at our health website in case you want to look healthier with a help of general health products. Our company provides a wide variety of non prescription drugs. Take a look at our health site in case you want to look healthier with a help of general health products. Our company offers a wide variety of non prescription products. Take a look at our health site in case you want to look better with a help of generic supplements. Our company offers general health products. Take a look at our health contributing website in case you want to strengthen your health.